Home / Freebies / FREE Sub at Quiznos for Downloading Quiznos Toasty Points App! Are you a saavy Mom that looks for ways to save when going out to eat? Even with a small family of 4 or 5 going out to eat can really add up quickly. I’m excited about the new Quiznos Toasty Points App which rewards you for your loyalty by earning 1 point for every dollar spent at Quiznos. Tonight I took my family to Quiznos and we all ate for $16.42. That included our FREE 4″ sub for downloading the new Toasty Points app! *Once you download the app and create an account you will receive a notification right in the app for your free 4″ sub. Then you can click on redeem and the cashier will scan the code right from your phone when you check out. Here is how your rewards will add up! Tonight, we spent $16.42 so right after I scanned my phone with the cashier, my rewards were added! The points go off your subtotal, which was $15.00 even for my order. As soon as I get to 20, I am eligible for a Free Regular Fountain Drink! If we are going to go out to eat, I like to know that we will be earning rewards for our purchases which in the long run will save us money. Tonight, they also had a few special deals going on which also helped us save! The real reward for me is not having to go grocery shopping for the food, prepare or clean up the food so to me this is a win-win situation! My kids each got a kids meal which come with a 4″ sub, chips or cookie and a fountain drink. It was $4.00 which is a pretty good price for a kids meal. They also got a rubber duck with it this time which was fun for them. They both said their sandwiches were really good too! Normally we’d stay to eat, but had to come home to eat because the weather got bad with some freezing rain, sleet and snow! 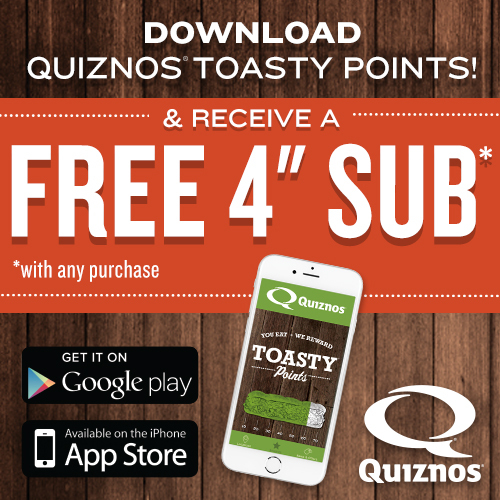 Don’t forget to download the new Quiznos Toasty Points app for your FREE 4″ Sub! This is a sponsored conversation written by me on behalf of Quiznos. The opinions and text are all mine. FREE $25 Amazon Gift Card With Audible Gold = $10 Money Maker!